Once the Republican Party’s figurehead during the Clinton administration, Newt Gingrich has returned from political exile. And like many with a new found sense of presidential ambition, Newt 2.0 is an aggressively and obnoxiously religious man. Pay no attention to the fact that he goes through wives like the Doctor goes through incarnations — I believe he’s on wife number Pertwee right now. Especially pay no attention to the fact that his marriages have all ended because of his infidelity, or that he left his last wife while she was recovering from cancer surgery, and while publicly attacking another man for his infidelity. Ignore all of that. One public Catholic conversion and a mea culpa appearance on CBN, and it’s all good. That’s the beauty of Christianity. Proclaim your new found (or re-found) belief in Jesus, apologize to a bunch of strangers who aren’t the people you wronged, and consider yourself forgiven! Tabula rasa! Why potentially spend years proving yourself a changed and moral person when you can just say it? What’s the worst that could happen with a belief system like that? Wait. What? How does that even work? I love how truly stupid people (or those just pandering to truly stupid people) seem to assume that all of the groups they dislike are all secretly in cahoots against them, even groups with diametrically opposed views and goals. It reminds me so much of the cinematic train wreck, Batman and Robin, where two of the Caped Crusader’s deadliest foes, Mr. 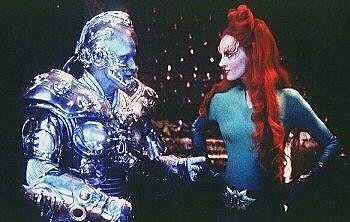 Freeze and Poison Ivy, team up to do him in. Freeze, as his name suggests, wants to bury Gotham City under a glacier. Poison Ivy, however, wants to turn it into a new Garden of Ede- um, never mind. Seriously. How far into the planning process would they have to go before realizing that this anti-Batman partnership is just doomed? Mutual dislike of a third party – especially if it’s the only thing you have in common — isn’t enough to build a lasting coalition around. Let’s look at this Schumacher-style team-up that Newt 2.0 envisions. Alright, so radical Islamists, like Al Qaeda, want to build an oppressive theocracy that stifles free speech and expression. They want to subjugate women, people of other faith groups, gays and lesbians and non-believers. They want to forcibly apply their dietary, sexual and clothing restrictions on everyone else. And they want to do it through the use of violence or the threat of violence or force of law. In their dream scenario, religion and government are one and the same. And atheists and secularists, like Richard Dawkins or Christopher Hitchens, advocate free speech and expression. We passionately defend the separation of church and state and protect even the rights of fundamentalists to speak and believe openly — just not in a vacuum, free from criticism. We tirelessly fight to prevent our elected officials from passing religiously motivated laws that would oppress women or gays and lesbians, or would forcibly apply religious dietary or clothing or sexual restrictions on people who do not choose them voluntarily. We want to challenge pseudoscience, junk science and conspiracy thought and drag the national dialogue into one based on independently verifiable facts and evidence. And even amongst our most strident, we do this through free speech, free expression, advertising, and writing. There are no threats of violence. No riots. No proposed laws to ban the position of the people we disagree with, or attempts (or calls) to kill or jail them. Can you see how quickly that sort of alliance would fall apart? Any freethinking atheist can look at how our brother and sister non-believers are treated by Muslim states that view clerical and state power as one and the same thing. This example helps motivate us to limit the influence of their western Christian counterparts. Why the hell would we trade one group of reactionary despots for another, especially when they don’t even disguise their goals? When I look at Western Christianity, I see very little different from Muslim extremism, save opportunity and freedom from constitutional secularism that theocrats in the Middle East enjoy. I find it especially ironic that those Christians who sounds the loudest alarm bells about Muslim sharia law in the United States are those most eager to install their own version of it. When Christianity ruled the West, they hunted “witches” and imprisoned scientists. This still happens in some parts of the world, murdered by the state for reasons we’d like to believe only exist in Monty Python sketches. Christianity lost its stranglehold on western society very slowly and it was a painful process, as constitutional restrictions on its power were devised, attitudes about the “other” have relaxed, morality has evolved in ways that have dragged modern religion kicking and screaming after them. In the West, religion no longer has the authority to kill those it disagrees with, or imprison blasphemers, restrict what we read or say, and society is all the better for it. Religion is all the better for it. This didn’t happen because Islam is from Mars and Christianity is from Venus.This didn’t happen because Islam is evil and Christianity is good. There is nothing that happens under Islamic rule, even the execution of witches and homosexuals, that couldn’t happen under Christianity if the brakes and handrails were taken off. In the United States, Pat Robertson can’t get away with sending his goons out on to the streets to perform virginity tests on random women or enforce the laws of Leviticus and Deuteronomy with AK-47s. He’d be in jail by the end of the day and even many evangelicals would be lining up to denounce him. I hope. 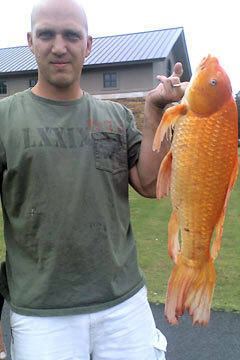 I’ve often said that religion is a lot like a goldfish, that it’ll grow to fit the restrictions of its bowl. In the secular West, the bowl is small indeed and restrains religion with modernity, pluralism and church/state separation. Many of religion’s worst excesses are kept in check by social pressure, the law and the courts. Christianity’s goldfish bowl in Africa has no limits. There are still Christian witch-hunters in Africa. There the work of Western Christian evangelical missionaries in conjunction with local legislators have pushed for the enactment of laws that punish people for the “crime” of being gay, either with imprisonment or death. As if this wasn’t bad enough, the fundamentalist Family Research Council actually lobbied against a resolution by the U.S. Congress condemning the bill. And it took two weeks of media pressure to convince Rick Warren, who spoke at President Obama’s inauguration, to speak out against the bill, as he had close ties to the legislator behind it. These are the people that Newt is pandering to. People who don’t have any serious issue with their African contemporaries slaughtering gays and lesbians for their natural biology. People who want to knock down the Jeffersonian wall erected between church and state and institute no less than theocratic rule. People who want rail against our “decadent” culture. People who want fables taught as science. People who blame demons or God’s wrath for the suffering in the world. In fact, no one seems to have more in common with Islamic radicals than Newt Gingrich’s own peanut gallery. And if there is going to be a Marvel Team-Up between belief-based groups, it’ll probably be aimed at non-believers. Does Newt not understand that the god he prays to, and the god the radical Islamists pray to, are one and the same? Is there ever a chance that a hard theist could be elected as president and at the same time enough hard theists be in high positions in gouvernment that the 1st ammendment could be repealed?. That depends on the interpretation. One can see them as the same god and figure the other guy’s getting it wrong. Or he can just saw the other guy is worshipping a different fictional god. Since there’s no evidence for the existence of either being, it’s a bit of a moot point. Also, please get a life and stop stalking us. How about i get a life and stop talking to you? In one of your shows why not bring up the consiqences of the 1st ammendment being repealed. Sorry ive got to go stalk Athiest Experience and hide in bushes outside Christopher Hitchens lounge window.Stalk you later. Also Beth it took a lot of courage and staying up late to make the effort to ring into your show.Like i said to Mike i will never swear but im not a good or pro debater.I write better than i can speak. Garry – Seriously, please get some help for yourself. Beth.You,ve just just made a big theistic mistake.Youve put faith in democracy.Have you ever encountered Sods law.It says if anything can go wrong it will go wrong.Also is American democracy fallable to majority rule.Come on open your mind.I know for a fact that American Atheists are treated with the same contempt and loathing as gays,muslims and anti-gun law people.Atheists must stand together. It’s like watching Fatal Attraction play out on the internet. Creepy. You guys haven,t the faintist idea what atheism is.Atheism is the struggle to destroy religion and unite the planet.Racism is dead as we are all the same spicies.The only thing deviding mankind is religion.Even the Arab states have worked this out and yet America still clings to 2000 year old bronze age literature.Come on U.S.A..China and Russia are becoming the new super communist powers.You need to smell the coffee and get with the programme or become the new Chilli or Argentina.Embrace science and renounce faith or you will be left to decay in your own self loathing. Also I really enjoyed this post Mike. Keep up the good work! Tyson you are a uneducated dope smoking theist hippy.Keep off the line.